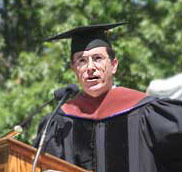 Stephen Colbert spoke at Knox College’s 2006 Commencement on Saturday, and they’ve been kind enough to post a transcript of his speech. But the best reason for me to come to speak at Knox College is that I attended Knox College. This is part of my personal history that you will rarely see reported. Partly because the press doesn’t do the proper research. But mostly because…it is not true! I just made it up, so this moment would be more poignant for all of us. How great would it be if I could actually come back here—if I was coming back to my alma mater to be honored like this. I could share with you all my happy memories that I spent here in…Galesburg, Illinois. Hanging out at the Seymour Hall, right? Seymour Hall? You know, all of us alumni, we remember being at Seymour Hall, playing those drinking games. We played a drinking game called Lincoln-Douglas. Great game. What you do is, you act out the Lincoln-Douglas debate and any time one of the guys mentions the Dred Scott decision you have to chug a beer. Well, technically 3/5 of a beer. Thanks for the link, That guy cracks me up.